Before I start, here is a small excursus on organic certifications in Germany and the difference between Reformhaus stores and organic supermarkets! In fact, throughout the article my own additions (background info and so forth) will appear in green font so it’ll be easier to distinguish them from the summaries of the presentations. In Germany there are very clear distinctions between certified organic products, non-certified organic and natural products and natural-inspired products. Organic beauty is very much part of the mainstream C&T market; the big four drugstore chains in Germany all have strong organic own label brands (DM’s Alverde is the market leader here). You can find certified organic cosmetics in every retail channel, from discounters over drugstores all the way to perfumeries and department stores, with prices starting at a few Euro. However, there are also certified organic beauty brands that carry a luxe price tag (think Chanel, Dior, YSL etc.). The big European certifiers include BDIH, Cosmebio, Ecocert and Soil Association (which are organised under the new Cosmos standard), then there is NaTrue (another big certifier) plus other standards such as Demeter (biodynamic agriculture and one of the strictest standards on the market). Most of these standards are similar, although some might differ on specific ingredients – Ecocert might allow a preservative that NaTrue wouldn’t certify, for example, but in general, each seal is as valid as the next one. Another key product seal in Germany is „Neuform“ which is the official standard of the Reformhaus association. Reformhäuser are a very German distribution channel (you can find Reformhäuser in Austria and in some areas of German Switzerland but other than that, these stores primarily exist in Germany): they are healthfood stores which sell brands and products that either carry the Neuform seal or are manufactured according to Reformhaus standards. The Reformhaus retail channel goes back to the reform movements of the late 19th century (bio-dynamic agriculture, vegetarianism, healthy clothing, anthroposophy and so on); the first Reformhäuser opened over a hundred years ago. You can google this; Wikipedia also has a small English-language entry for “reformhaus”. Not all Neuform products are certified organic (just to make things more complicated!) so “certified organic” and “certified Neuform” is not interchangeable. As a result Reformhäuser carry a different product portfolio than organic supermarkets. Although they might sell some fresh foods, Reformhaus stores primarily specialise in dried health foods, superfoods, vegetarian products, substitute foods (sugar and flour substitutes), nutritional/dietary supplements and reform products. Many of the brands sold in Reformhaus stores will (also) be certified organic but not all of them. In contrast, most organic supermarkets in Germany – and certainly all of the big organic retail chains – sell only certified organic products and would not touch a Neuform certified brand unless it also carried an organic certification. And now let’s dive straight into the first presentation! As always, the conference started with an overview of the German organic beauty market. The speaker was Elfriede Dambacher from Naturkosmetik Verlag, one of the organisers of the Conference. Dambacher began by briefly outlining some of the key trends in the international organic market: The retail market is continuing to change, with online stores increasing their market share. Another key development is the growing popularity of ethical products (halal certified, Fair Trade, vegan and so on). Consumers are driving the market with their continuing demand for natural and clean label products (paraben-free, GMO-free, that sort of thing). As a result, the C&T industry is changing as well; manufacturers and companies are becoming more eco-conscious. This, of course, also means that green-washing is continuing to flourish. Then Dambacher turned to the German market. Looking at the market data for the organic beauty sector last year, the market managed moderate turnover increase only – not surprising really, since Germany is a highly saturated market. Still, at least this is stagnation on a very high level! Consumer behaviour has changed as well; people buy more organic cosmetics and much more frequently too; per capita expenditure actually increased by 2.50 Euro. Consumers are also getting younger and their expectations are growing which makes the market more competitive. As a consequence, the light green beauty sector (natural and near-natural cosmetics) was one of the winners last year, with a higher growth rate than the certified organic market. Again, this is not a big surprise; the conventional C&T market has become much greener in recent years and this is also driving the near-natural sector. Many new niche brands are appearing on the market these days, most of which are retailed online rather than in bricks & mortar stores. And since the large retail chains are not reacting fast enough, the online sector continues to increase its market share. As in previous years, the very competitive drugstore channel was one of the biggest distribution channels for organic beauty in Germany last year. The on-going competition between market leader DM and second-in-command Rossmann continued to drive the market although the sector as a whole only grew 6%. Perfumeries managed an increase of 24% (albeit from a very small market share), while hypermarkets grew 11% and normal supermarkets increased their share by 4.7%. The turnover of Reformhäuser and organic speciality stores, on the other hand, was stagnating. Dambacher also pointed out that in many organic supermarkets, the beauty line-up is becoming quite similar – you can find the same dozen brands pretty much everywhere these days. This has also to do with the portfolio regulations for certain stores types: the large organic supermarket chains in Germany, for example, all follow the official regulations of the Bundesverband Naturkost Naturwaren (BNN), one of the key organic industry associations in this market. According to BNN regulations, a member store can only retail certified organic products and brands. As a result, a non-certified organic beauty or food brand is not allowed on the shelf, no matter how interesting and innovative the products might be. This has pros and cons: the BNN guidelines mean that if you shop at one of their retail chains, you can be certain you only buy certified organic products. On the other hand, non-certified labels are not listed which means that many small brands never make it into the mainstream organic market. This creates a paradoxical situation: there is a strong and growing consumer demand but at the same time not enough interesting retail offers, especially for consumers from the X and Z generations. X and Z consumers are young, trend-driven and non-dogmatic (they are amongst the key demographics for organic cosmetics): this group does not require that everything be 100% certified but they do demand original, innovative and niche beauty brands and an exciting retail environment. Yet another reason why online stores are growing so strongly. And why retail concepts that combine organic and natural brands were amongst the most successful store types last year. The next presentation was all about German retail and market research, full of charts and figures, just the way I like it! The speaker was Susanne Eichholz-Klein from Institut für Handelsforschung Köln (Cologne Institute for Retail Research). Certified organic and natural cosmetics account for 15.4% of the entire German C&T market last year. Of this total, 8.2% belonged to certified organic cosmetics and 7.2% to near-natural beauty. Organic beauty is profiting from the general trend towards health and self-optimisation – one of the reasons why vegan and clean-label products are growing so strongly. According to Eichholz-Klein, the majority of under-30s say that they are willing to spend more for healthy products. For many consumers, health comes before saving the environment: 82.3% think it is important to do something for their health, 67.8% are more concerned about their health than they were a few years ago, and 66.3% are prepared to pay more for products that are better for their health. The German C&T market is driven by women and younger consumers; big topics are claims like “aluminium-free”, “mineral oil-free” and “organic”. Health awareness is a key influence in a number of FMCG categories (including, of course, food and cosmetics) and this trend is strongly dominating the personal care market. Interestingly enough, Eichholz-Klein pointed out, many customers buy both organic and conventional products: they are hybrid consumers who make their purchasing decisions spontaneously and always different. As a result, brands need to constantly interact with their demographic, keeping them interested and invested. Today’s consumers use numerous sources to research cosmetics brands: product counseling in-store, recommendations from friends or acquaintances (peer marketing), magazine and TV ads and online product reviews. And digitalisation is steadily changing our consumer behavior, as well, Eichholz-Klein says. 38.5% of all purchases in German bricks & mortar stores are prepared online (by doing online research), the other way around (research in-store, buying online) only accounts for a 10.3% share. In 2008, these percentages were 23% and 27% respectively. A big shift in shopping habits. With the “smart natives” demographic (also called digital natives), 54.7% of stationary purchases are prepared online while 23.8% of organic customers look in bricks & mortar stores first and then make their purchase online. My own purchasing patterns are quite similar: sure, I’d prefer to buy all of my organic cosmetics in my local store but I love niche and international brands, so I order quite a lot of stuff online. Or buy it when I am travelling. I’m definitely a hybrid consumer! I usually come across exciting-sounding brands online first (on international beauty blogs, social media and so on), then I research whether there are any stockists in my country. If none are close by, I purchase online. And yes, I also buy on Amazon. That was another key point of Eichholz-Klein’s presentation: Amazon is by far the biggest online store in the Western markets. That’s a fact and there’s not much use complaining about it. More than 95% of consumers in Germany are aware of Amazon; the top 19 online stores (excepting Amazon) account for just 5% of the online market. Amazon’s the Alibaba of the West! More than 50% of all beauty brands have their own online store and 67% also operate an Amazon store. In this kind of crowded and fast-moving digital marketplace, the key challenge for retailers is to increase their visibility. They also need to react to their customers’ demands for transparency: satisfy enquiries about ingredients (organic/non-organic/percentage of organic ingredients), about sourcing (Fair Trade/normal/sourced locally) and manufacturing (where is the product made/where does the packaging come from?). Many younger consumers research controversial ingredients online, they are critical and well-informed (this applies especially to organic consumers). An online presence is also important and makes a company or brand appear more believable. Also, many retailers and brands still do offer not nearly enough product consulting services in-store, Eichholz-Klein pointed out. The presentation of French trend researcher Pascale Brousse from Trendsourcing also focused on health as a key driver of the C&T market. Brousse pointed out that today’s beauty consumers are experts: they are aware, informed and critical, with high expectations of brands and products. Health is a lifestyle statement and integrative/holistic health concepts are on the rise: in the C&T industry as well as in other sectors. And, yet again, digitalisation is changing how consumers approach the matter of their health. Wearable tech is a major trend, as are health apps that track nutrition and fitness. And then there’s “healthtainment” on social media sites such as Instagram: celebrities who market their own line of supplements or superfoods; yoga practicioners, exercise trainers and fitness coaches who post videos and downloadable files and have hundreds of thousands (and in several cases, millions) of followers. There are entire online communities dedicated to health and wellness. Another interesting development is “augmented reality fitness” – cyberobics, for example, or digital cycling (you sit on an exercise bike in a darkened room with a screen in front of you; the optical illusion of cycling through a landscape). And then it gets even more technical: fitness watches and so on are only the first step; wearable tech can also include “smart shirts” with integrated sensors that track the way you sit and can actually exert a light force to make you change your posture. Brousse also gave the example of a “tracking tattoo” which is currently under development: a patch combining electro-conducive paint and microchips which is applied to your skin and tracks your heart rate, stress levels and skin temperature. Or take the example of Japanese company Shiseido’s Haku mask: it’s a face mask with integrated electrodes that is designed to boost the absorption rate of the mask’s active ingredients into your skin. Fascinating stuff. At the same time nature is becoming more glamorous – or rather, beauty brands are focussing on the organic, sustainable and healthy aspects of their products, ingredients and packaging. This is also one of the reasons why the light green cosmetics market (near-natural products) is growing so strongly: eco is trendy And here we have the hybrid Gen X/Z consumer at work again: organic, ethical beauty must come in stylish packaging and with an interesting brand story attached. If the products aren’t 100% certified organic, that is ok, too. As long as the brand is something special/niche/unlike the other beauty brands on the market. Brousse’s conclusion: today’s consumers are health-focussed and hyper-aware: monitoring their own health and fitness levels through a combination of digital and online tech and apps. Cosmetic products, especially skin care, are developed along the lines of a medical prescription: clean ingredients, personalised products and transparent INCIs. Beauty/functional foods are on the rise, too. All based on the assumption that this is making us healthier/happier/more balanced individuals. The keynote speaker of the conference was Professor Jo Groebel from Deutsches Digital Institute. He spoke about the digital consumer in Germany and about new possibilities for online marketing and brand management. Groebel began his presentation by briefly characterising the digital market: compared to other countries, Germany is lagging behind in terms of connectivity and online activity. And although Germans are enthusiastic online shoppers, they are still trailing behind other European countries in that respect. Even so, digital developments are changing the way we perceive and process information and, of course, how we react to advertising, brands and products. A few decades ago, the cosmetics market was characterised by a certain number of traditional, well-established brands that came with a traditional brand ideology. Consumer demographics and lifestyle concepts were also more tightly focused. Today, however, you have consumer “tribes” with vastly differing lifestyle choices, consumer behaviour patterns and dynamics. Information accompanies us throughout the day which in turn dramatically changes our consumer behavior. You can find thousands of products and brands online, much more than in bricks & mortar retail, no matter how large the store might be. This is a excellent opportunity for small brands, Groebel said: it is much easier to present new products online than in mass market distribution. Also, the range of social media and digital marketing sites offers brands the opportunity to create awareness and impact in exchange for comparatively little money. This is particularly beneficial for small brands which tend to have trouble competing with the major players; at least when you go by traditional media budgets and advertising strategies. A bit of online creativity, however, can go a long way. However, a good rule of thumb is to “act first and then promise”: before announcing loudly that your brand will now be on all digital channels, blogs, Facebook, Instagram, Twitter etc., make sure that you can actually follow through with this. Consumers are very critical indeed and can instantly tell if a brand is only producing hot air. So to speak. Groebel said that brands should make sure they have a realistic digital strategy: social media sites need to be constantly updated with relevant and interesting information. Otherwise the transparency and credibility of the brand can suffer. He also pointed out that the organic beauty industry has a key advantage over the conventional cosmetics industry: the brands and companies that operate in this sector are already value-oriented, ethical and sustainable (all key values for today’s C&T consumer!). On the other hand, there are distinct challenges: brands must combine their traditional heritage with modern influences and coolness, targeting a range of different consumer groups/tribes (loyal consumers, new consumers, hybrid consumers) at the same time. And successfully combining classic communication and marketing strategies with the new digital/online marketing possibilities. There was also an interesting presentation by Benjamin Thym from German online company Offerista. Offerista specializes in online advertising and location-based PR services. The company has some 6 million monthly users across its two main products: Marktjagd.de is a site that offers digital versions of product brochures and special offer leaflets of both online and offline retail chains – basically, you can check online what your local supermarket or electronics retailer has on special offer this week. And then there is Offerista’s barcode-scanning app Barcoo. Barcoo works with physical beacons – little plastic gadgets – which are attached to cash registers and store entrances. When a consumer with the Barcoo app on his/her phone walks past (or inside) a beacon-equipped store, he/she receives a message about the latest product launches of specific brands or special offers. Thym gave some example of recent Barcoo advertising campaigns – like Beiersdorf’s Nivea Sun which started a Barcoo campaign in drugstore retailers DM and Rossmann’s, or Estée Lauder-owned brand Clinique which used Barcoo for a campaign in selected outlets of the Müller drugstore chain. On the first afternoon of the conference there was a fascinating panel discussion. Panelists included Susanne Eichholz-Klein from IFH (DE), Jo Groebel from Deutsches Digital Institut (DE), Fabienne Marty from Organic Promotions (CH), Sonia White from Amarya (UK), Hendrike Gruber from Swiss artisan beauty brand Ponyhütchen (CH), Elizabeth Huber from Schweizer Drogistenverband (Swiss drugstore association, CH), Benjamin Thym from Offerista (DE) and Christian Prokopp from drugstore perfumery chain Prokopp Gewußt wie (AT). It was interesting and I had my laptop with me, so I was able to basically type along. Here’s an informal transcript of the panel session. Sentences in green are mine. Enjoy. Christian Prokopp started the discussion with a brief presentation about how he successfully extended his retail chain’s customer base by adding an online retail presence to his bricks & mortar outlets. The moderator then asked Prokopp about which channels he thought were most important – the answer: bricks & mortar retail have to be entwined with digital media. Question to Eichholz-Klein: what is the best long-term retail strategy for a brand? Eichholz-Klein: if a retailer has bricks & mortar stores he doesn’t necessarily need an additional online store. At least not if the sales through the stationary outletoutlets are satisfactory. What every retailer needs, however, is an online presence so that consumers can find it. White was asked about how she managed to make Lovelula so successful? Lovelula is an organic online perfumery which was launched by Sonia White in 2006. In 2011 Lovelula began offering subscription beauty boxes and in May 2015, White opened a second online store: ManOrganic sells organic cosmetics for men. Some serious entrepreneurship! White said that persistence had probably been one of the most important aspects of building up her store. She also pointed out that organic beauty is comparatively easy to sell since it is a highly ethical and attractive product category. Question to Fabienne Marty: do consumers still want a retail experience? Marty said: yes, the impulse/the wish to experience something is still there. And this experience can also be implemented at the POS in a high-street store, not just online. Bricks & mortar retail has been pronounced a dying sector quite a few times, Marty said. And yet retail stores are still around. Question to Hendrike Gruber: Ponyhütchen will soon open a premium store in Berlin – do you fear that your customers will not appreciate the premium positioning (and pricepoint) of the new outlet? Gruber replied: no, the consumer wants products that have a pleasant texture and a nice fragrance. And although Ponyhütchen’s customers research the brand and its products online at first, they still like to try them out before buying. Gruber’s beauty brand Ponyhütchen is a prime example of a successful online-to-offline retail transition. She started selling her hand-made cosmetics online at first and has just opened her first retail store in Berlin. Gruber also said: the online world is like a digital playground – you can interact with the customer on an entirely different level; react directly to feedback. It’s a bit like beta testing; you get the customer’s unfiltered wishes and demands. Question to Benjamin Thym: how can a brand increase its online visibility? Thym: as a retailer it is important to have an online shop or at least a website. You should also analyse where your customers actually spend their time; which social media sites or services do they use? Are they more on Facebook or on Instagram? It is also important to think about how a brand can connect with customers of different ages and from different demographics. After all, everyone likes a bargain, no matter what their age. Question to Jo Groebel: What are some of the differences between the organic beauty market and other consumer goods sectors? Groebel said: there are specific target groups; we still see a lot of demographic differences. However, the development is more in the direction of situation-specific consumer behaviour: we shop differently depending on the season, on our mood (happy or sad), on the time of day/night or whether we are on holiday or not. There are so many different retail situations, everything has become more flexible. Affiliate marketing can also help: working with brands that come from different sectors but have something in common with your own brand. There were a number of questions and statements from the audience. Here are some of the answers given by the panelists; I didn’t catch all the questions so this is a potpourri of what the panelists said in the final Q&A. Prokopp: customers changing from one brand to another is strongly influenced by the availability of product samples and the quality of the personal consultation. Question to Jo Groebel: what could or should I do first as a beauty brand? Groebel: The coolness factor is very important, organic cosmetics often look a little boring. As a brand owner/manufacturer one should at least try out some of the social media channels. The consumer often “leapfrogs”, changes his or her consumer behaviour depending more on external factors and less on the physical/chronological age. Dare to take risks. And be professional (make your brand look professional) in today’s digitalised world. Fabienne Marty: within the organic beauty market, both the mass market and premium sector are growing. If you want to lure consumers from conventional luxury cosmetics into the organic sector you have to compete with brands like Gucci or Dior. That can be difficult; the typical La Prairie customer is used to high prices but also spoiled, she will demand organic products that are as“good” as conventional luxury brands (in terms of texture, fragrance, packaging). Hendrike Gruber: on social media sites and in social networks it is vitally important for a brand to be authentic. An indie brand like Ponhütchen has an entirely different way of communicating with its customers than a traditional, well-known brand like Weleda. Question to Sonia White: how does the online market in the UK compare to the German e-commerce market? White: Germany is at the forefront of the organic industry. The e-commerce side, however, is not quite as evolved as in the UK. Half of Lovelula’s customers access the site on their mobiles but you can’t really do much on a smartphone – a site needs to be made more suitable for mobile phone browsing. Jo Groebel: Editorial copy which harmonises with the organic beauty market can also help to market an online store or brand. The copy doesn’t need to be exclusively about cosmetics: think about what else your target demographic likes to do, read, eat or shop. That way, you can develop a typology which supports the online retail experience, making it more exciting and interesting. Hendrike Gruber: You don’t need to do everything 100% correctly. It is more important to find out what works for your particular brand. Sonia White: ManOrganics lists a lot of the brands that are sold on Lovelula. However, the marketing, the front-end and the way the company reaches out to the customers is completely different from Lovelula – less pink and more masculine. Final questions to all panelists: What retail situation will we have in five years? Christian Prokopp: a stronger connection of online and offline retail. Sonia White: similar to today. However, there will also be more growth in social media platforms. Fabienne Marty: a closer merging of online and offline; the focus will, however, be on bricks & mortar retail and on better/more exciting retail experiences. Hendrike Gruber: bricks & mortar retail will act as a kind of show-room/display for online retail. Benjamin Thym: part of the retail will have moved into the online channel, both in terms of interactivity and as regards financial/purchasing transaction. The retail world will also be a little more exciting and emotional. During the panel discussion there were some interesting fact & figures from online market research agency Pollion. Pollion has an intriguing research concept, by the way, they conducts surveys and market report studies by app! The company had polled 1200 consumers about what sources they used for organic beauty research. 80% of the people polled were women (no surprise there!) and almost 80% of these consumers said that they used online sources. The demographics from 40-49 years and 50+ primarily went to the company or brand website to inform themselves while 37% of the 50+ group and 62% of consumers ages 18-29 years used blogs for their research. The last presentation of the first day was from packaging manufacturer Brandpack. Brandpack’s Creative Director Charles Calvert identified four main trends which are influencing the packaging sector at the moment. Interestingly enough, these are all trends from the organic and even conventional cosmetics industry: Sustainability, Digitalisation, Personalisation and Premiumisation. He then proceeded to give packaging examples for each trend. Take sustainability, for example. The question is here: how can packaging material be used in a better or more constructive way? Can it be recycled or otherwise reused? German brand Ringana found an innovative solution to this dilemma: they used cotton towels as packaging for some of its body care products. Premiumisation: emphasise the tactile, tangible beauty of packaging and pack design – use a special paper, cardboard or other material, upgrading or embossing patterns or prints. Brand example: organic chocolate brand Original Beans who have gorgeously designed cardboard packaging made from uncoated paper– stylish, elegant and beautiful to touch. And still completely sustainable. Personalisation: tailoring products to the individual customer demands, deciding on the fragrance or a special packaging style – a successful example for this: Berlin-based DIY organic cosmetics brand Coscoon which sells DIY beauty kits (you can create your own body lotions, soaps and so on). Digitalisation: traditionally, Calvert said, the function of packaging was to protect the product (from contamination, sun exposure, temperatures etc. ), communicate what it is about (ingredients, description, name) and contain it (prevent it from spilling/leaking out). The next level was smart packaging: monitor the freshness of the product, improve convenience (make it easier to open, or extra portable), extend shelf life (again, the protective function of packaging), display info and improve safety (of the products). Now, there is digital packaging: in this context digital packaging means packaging that is equipped with codes and tags that make it easy to track or to monitor shipments batches or order replacements/new stock in time. In addition to taking on all the other “usual” packaging tasks (protecting, informing and so on). Innovations in packaging material and production processes also make packaging – and therefore the packaged product – more sustainable, Calvert said. Using metallised paper, for example, saves on plastic while cold-processed foil is better for the environment than hot-processed foils and soy inks are more sustainable than artificial inks. The second day started with a brief presentation by Fabian Ganz from German market research company Biovista. Biovista specializes in market research for organic and Reformhaus retail and Ganz presented some interesting figures about retail patterns and consumer behaviour of customers shopping in organic supermarkets as opposed to consumers purchasing in Reformhaus stores. Biovista has attached scanners to the cash desks of selected stores which track the items that are purchased in these outlets. The data analysis in the presentation focused on the organic beauty category and compared sales of organic cosmetics in organic supermarkets with sales of organic cosmetics in Reformhäuser (for some of the key differences between these two retail channels, scroll up the page to the beginning of the article!). In terms of percentage developments, Reformhäuser increased their turnover by 6% for food and non-food products in 2015. Organic supermarkets saw a similar result; both are a consequence of the continuing vegan trend. However, organic cosmetics didn’t quite profit from this sales increase. The market stagnated last year, with a very slight 0.9% increase for organic supermarkets and a slight dip in the Reformhaus retail sector. Personal care accounted for a 16% share of all purchases that were tracked in the Reformhaus market. In organic supermarkets, cosmetics only accounted for a 4.6% share of the market. Basically, organic beauty turnover couldn’t keep up with the sales increase in organic food products. The average shopping basket spend in Reformhaus stores was 14.96 Euro per capita: products were mostly dietary supplements and wellness/functional food and non-food products. Cosmetics accounted for 10.5% of the total spend. In organic supermarkets, the average shopping basket registered turnover of 17.96 Euro – the reason why this total is higher is that the organic supermarket basket also includes daily-use food products and fresh foods. However, only 5.6% of this supermarket spend went to cosmetics. Beauty consumers that visit organic speciality stores tend to be premium consumers. Face care is the most important product category in this retail channel while in organic supermarkets, daily care cosmetics (shower gels, body lotions, shampoo etc.) account for a larger share of the total. In the next presentation, market research consultant Klaus Braun spoke about the developments and market dynamics of organic cosmetics in the Reformhaus channel. Braun said that over the last five years, the market share of cosmetics in the Reformhaus/organic speciality channel has decreased quite a bit. In 2010, cosmetics still accounted for 6.4% in the organic speciality retail channel. In 2015 this share had dropped to a 4.9%. Retail turnover for cosmetics reached a 7.4% share of the market in 2015, and 10% in terms of shelf space. Braun also stated that today’s organic supermarket consumers want more than just ecologically correct products . “Organic” is no longer a strong enough USP. After all, in Germany you can find scores of organic brands in all retail channels and all price ranges; believe me, it is really difficult for a new brand to stand out on the shelf! Today’s organic beauty consumer also expect qualified advice (which is sadly lacking in many organic stores) and could/should be targeted through POS marketing activities or by utilising personal recommendations. Offerring an unusual brand portfolio can help as well. Braun said that independent and family owned organic supermarket have a good the chance to differentiate themselves from the large supermarket chains (who by and large tend to sell the exact same beauty brands) by focusing on small, innovative and independent organic niche brands (see presentation from Elfriede Dambacher above!). Differences in the product portfolios (and category management!) will continue to sharpen – and this offers an excellent opportunity for small organic stores. Every year, the Conference has two special panels on the second day which take place at the same time: one session is usually retail/marketing-oriented while the other session focuses on an ingredients topic. This year, we had the choice between the organic cosmetics market in the US and a debate about palm oil. Since I am more interested in retail trends (and my favourite organic beauty labels include several US brands! ), I decided to attend the US naturals session. There were two speakers, Kora Lazarski from US trend research agency Spins and Marko Kucher from marketing consultany Make Solutions. Lazarski gave a very comprehensive presentation on the US market. She began by introducing the main retail channels for natural cosmetics: groceries (multioutlet hypermarket and supermarket chains like Walmart, drugstore chains like Target and natural & health speciality retailers), department stores/perfumeries with multinational brand boutiques (like Macy’s or Bloomingdale’s; or, on the perfumery side, Sephora and Ulta), indie boutiques/salons (this category also includes social-media driven retailers and blogger beauty platforms) and classic e-commerce stores (including large-scale retailers like Amazon, beauty.com or Net-A-Porter, but also the online stores of bricks & mortar retailers like Walgreen’s or Target and independent beauty retail stores such as peachandlilly). Lazarski said that the cosmetics market in the US grew 1.9% to 36.3 billion USD across all retail channels in 2015. Natural cosmetics account for 1.9 billion USD and grew 11.8% last year. Spins tracks different brand categories in the “Green” beauty category: Natural Standards (with certifications, EU brands), Speciality Standards (similar to Natural Standards but marketed as speciality), Natural Perceived (entry-point green brands that tend to have a wide distribution) and Conventional Naturals brands (allergy-free or free-from brands, typically with some green content but no actual natural or green positioning). The company uses a cross-channel analysis market research approach, dividing each retail channel into the categories organic, health & wellness and conventional products. In the three main retail sectors “Natural” (organic and healthfood specialist retailers), “Speciality Gourmet” (traditional supermarkets and delicatessen stores) and “Conventional Multioutlets” (hypermarket giants like Walmart or Target) all showed solid growth last year. In the Natural channel, total channel sales grew 8% to 7.8 billion while natural products and speciality/wellness products each registered an 8% increase. Total channel sales in the Speciality Gourmet sector rose 4% to 8.3 billion USD, with natural products and speciality/wellness products growing 8% respectively. The Conventional retail channel (L’Oréal, Estée Lauder et.al.) accounted for the biggest turnover of all sectors: total Conventional channel sales reached 605.5 billion USD which, however, marks a comparatively mild increase of 2%. Natural products in this channel, on the other hand, shot up 12% while speciality/wellness products registered a turnover increase of 8%. Lazarski also gave some store type definitions: food retailers include supermarket chains like Safeways, Giant Eagle or Ahold-Delhaize while the drugstore sector includes health and beauty chains like Walgreens, CVS or RiteAid. And “multioutlets” means big box retailers and hypermarket chains like Target, Walmart or Sam’s Club. In all three store categories, natural products grew much quicker than the actual market: according to Spins’ data, total product sales in the food channel grew 2.3% to 5.6 billion USD while natural products within this sector climbed 19% to 232 million USD. In the drugstore channel, total turnover reached 6.8 billion Euro (+0.7%) and natural products grew 23% to 197 million USD. And in the multioutlet sector – which, unsurprisingly, is by far the biggest market – total product sales reached 28.7 billion USD (+2.3%) while natural products shot up 23.4% to 858 million USD. Label claims are another interesting topic: in her presentation, Lazarski gave examples of some typical “avoider ingredients” claims you can find in the US: in the multioutlet channel, “paraben-free” is a major claim, as is “SLS-free”, “vegan” and “gluten-free”. In the natural cosmetics sector, “paraben-free” and “organic” are topping the list. Natural products for children and babies have seen rapid mainstreaming in the last year while skin care is the category driver in the general C&T market, followed by hair products, soap & shower and oral care. In terms of actual dollar growth, hair care is in first place. Nutraceuticals in vitamins, supplements and beverages – think functional drinks and foods. K-Beauty and sheet masks. Charcoal products, sheet masks, classic Asian product textures like lotions or essences – example: Korean brand Whamisa’s sea kelp mask! (Whamisa’s one my my favourite organic beauty brands EVER!). Another big trend is “active beauty”: deo towelettes (for freshening up on the go), or sweat-proof products for active lifestyles. Natural brand Mother Dirt has launched an anti-bacterial mist, for example, which neutralizes odours. Speeding up hair care is also a trend – think dry shampoo, unwashes, cowashes and hair mists. The cowash trend (washing your hair with conditioner) hasn’t quite reached Germany yet but it’s probably just a matter of time. And dry shampoos are still enormously popular over here. According to Spins, we will continue seeing more active ingredients in cosmetics; another trend is localization (local and regional products to help a brand differentiate its portfolio from its competitors). Localization is also a key trend in the German food and beauty industry. Ethnic-positioned products are also going to grow – like Korean beauty: more diversity in skin care and hair care (products for Asian or African hair and makeup for different skin tones). There will be a change in channel flow, with product or brands launches starting in one channel and then moving into another retail sector – from online sales into bricks & mortar retail, for example, or brands moving from mainstream multioutlet retailers into the natural/health food sector. Another major trend is “business as a mission”: if a brand has a deeper purpose or moral positioning (sourcing ingredients from fair trade or charity projects, for example), marketing measures need to highlight this. There will also be further M&A activity, more consolidation: big consumer goods manufacturers acquiring promising beauty brands. In her conclusion, Lazarski said, the following strategies can help a brand to become (or remain) successful: a strong distribution strategy, clean label formulae (simplicity! ), strong and creative marketing which focuses or emphasizes a brand’s mission (story-telling!). Marko Kucher outlined some of the challenges that organic brands from Europe are facing in the US market. Compared to European standards, the US organic beauty market is not particularly well defined. The only domestic organic seal is from the USDA and that is primarily a food certification. Kucher says that natural cosmetics are primarily sold in a grocery/health food environment. And this natural/health food channel is fragmented, with many small and independent stores and only a few larger chains, such as Whole Foods or Sprouts. In mass market retail, natural brands are still a niche category: there are only a few brands that have successfully made the transition from the natural retail channel into the conventional C&T mass market. In many health food stores, the beauty shelves tend to be crowded with products; there is little space for individual marketing or brand building. Organic and natural brands are all fighting for space. I’ve seen this in some of Whole Foods’ London stores; the shelves are simply crammed with beauty products (one brand next to the other); it is difficult to distinguish between certified organic, natural and green cosmetics. Rather messy and very confusing. With such a competitive shelf situation, European brands can find it difficult to stand out on in terms of packaging and brand presentation, Kucher said; particularly since European brands are usually positioned in the top price range of the premium beauty segment. The distribution of natural products in the US also differs from the situation in most European countries: geographically the US market is very large indeed; it is decentralised and there are few distributors that cover the entire market. Instead, you tend to find regional sales brokers that handle individual geographic regions. I found this very interesting: as a European I sometimes forget that not all markets are as compact and centralised as Germany (or indeed as most European markets). Countries like China, Russia or India extend over so much land mass, with different climate zones, ethnicities, languages and religions; major demographic differences between urban and rural populations, drastically varying levels of analphabetism and education – in these kind of markets, the challenges of successfully marketing a brand must be staggering! But now back to the Natural Cosmetics Conference! In the afternoon there was an Expert Discussion about consumer safety & transparency, a fascinating-sounding lecture on different skin types/requirements by R&D specialist Rainer Voegeli from Swiss company DSM Nutritional Products (I say fascinating-SOUNDING because it was highly scientific and technical lecture and I only understood around half of it. However, I did enjoy the slides about water gradients in the skin, epidermal programming, Natural Moisturizing Factor and what desquamation in dry skin looks like on a corneal level). The final presentation of the conference was from trend researcher Inga Nandzik of Hamburg-based trend agency Sturm und Drang. Nadzik spoke about “Beauty 3.0”: how the digital age is changing our perceptions about what is beautiful. Again, a really interesting topic! Nadzik said that it is important to observe the cultural context of our lifestyle, because this is what determines our self-understanding and self-perception. And, by extension, this also influences our consumer behaviour and with it the consumer goods market. And the biggest change of the last two decades has been globalisation and the digitalisation of our world and our society. A world without borders, where everything is connected, has also resulted in a democratisation of what we see as beautiful. The classic juxtaposition of “natural” and “artificial” is slowly dissolving and we are constantly exposed to different concepts of what is considered beautiful. Also, Nandzik pointed out: beauty is no longer a god-given thing that you either have or haven’t. Instead, it has become malleable; you can change the way you look – think self-optimisation, monitoring your health with digital gadgets, joining fitness communities or even going for invasive/non-invasive aesthetic surgery. The health trend in action! See also Pascale Brousse’s presentation. In the virtual world there are even more ways of changing and improving the way you look – Photoshop, filters and so on. An interesting counter-trend to this is the “#nofilter” or “#nomakeup” movement. Anyway, Nandzik said these days we are always in beta, always in a process of change. Organic cosmetics used to stand for certain kind of asceticism – reduced ingredients, something that would not negatively influence the environment – and in the beauty industry as a whole there was a clear distinction between natural and artificial. This is now changing: as witness the continuing success of cosmeceutical products and mainstream skin care which is becoming ever more technical (think fillers, optical highlighters, blur products). And as far as organic beauty is concerned, simply offering an eco product isn’t enough. The modern customer wants more. This also means that companies have to build up a much more interactive relationship with their customers. The customer wants a brand to accompany him or her on the way to sustainability, to make it easy and pleasant to live in a way that respects the natural resources. This applies especially to the Millennials generation, one of the most important demographics for the organic beauty industry. The consumer’s attention span is also getting shorter – we all know about the Google effect! – and this means that brands have to get creative. In today’s interconnected world there are many options to communicate with a target demographic. In order to stand out from the crowd – and today’s consumer is bombarded with constant advertising messages and visuals – a brand needs to focus on the narrative, on its brand story (beauty as a mission, vide Lazarski’s presentation). Nandzik mentioned UK beauty brand Andrea Garland as an example: aromatherapist Andrea Garland started out by selling hand-made balms in little vintage tins and pill boxes which she picked up on fleamarkets. The brand become so successful that today Garland has vintage-looking boxes manufactured especially for her cosmetics. 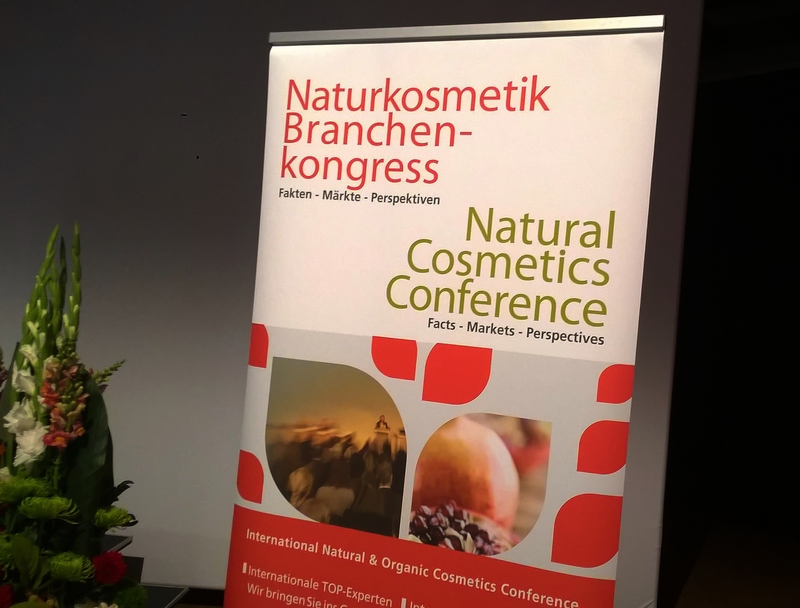 So, that was this year’s Natural Cosmetics Conference! I hope you enjoyed the article. The next Branchenkongress will take place from 26th-27th September 2017.